Over the next few letters we will consider the various monsters that may set upon us. Any one on its own might be manageable, but we’ll be out of luck when several hit us in rapid succession. 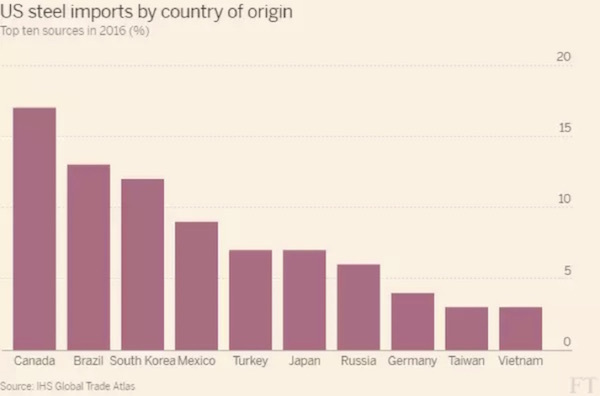 We’ll start with this big bad boy: Trade War. For the last 20 years, the biggest monster in my worry closet has been protectionism and trade wars. Last year both presidential campaigns voiced ideas about protectionism and trade that reflected appalling economic ignorance about the importance of trade to global prosperity, and particularly to the prosperity of the US. As I explained in “The Trouble with Trade,” I hoped then that the talk was all just campaign rhetoric and political pandering. No such luck. 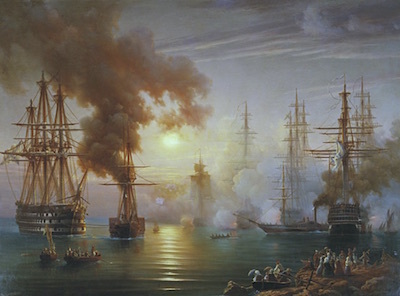 Trade is the global economy’s bloodstream. The more freely it flows, the better for all. As David Ricardo explained 200 years ago, different peoples have unique characteristics that enable them to produce certain goods at lower opportunity costs than other can. Free trade gives consumers access to the best goods and services at the lowest prices. The third reason to oppose tariffs is that clamping down on steel imports threatens considerably many more jobs than “protecting” the steel industry from foreign competition can save. 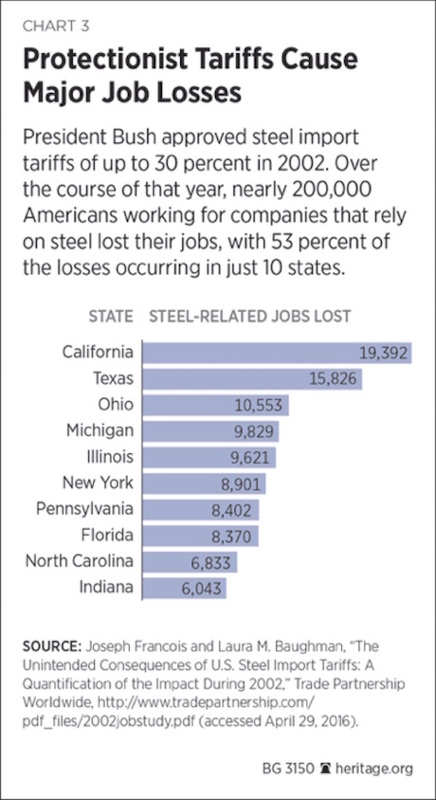 As Dan Pearson of the Cato Institute noted recently: “Steel mills employ 140,000 workers. 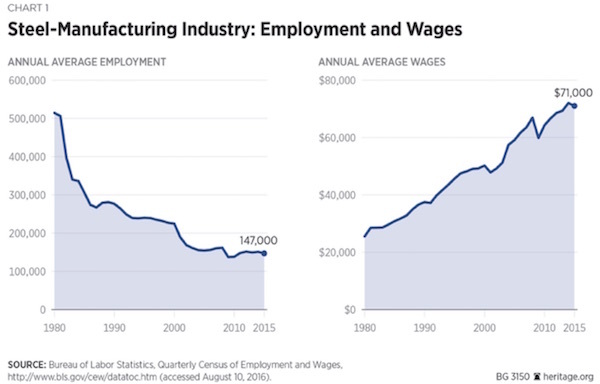 Manufacturers that use steel as an input 6.5 million, 46 times more.” Steel mills’ $36 billion of productivity in 2015 represented just 0.2 percent of US GDP, Pearson explains, while the economic value contributed by US firms that use steel was 29 times larger. Scores of different types of steel are used for special manufacturing processes and equipment. The US doesn’t manufacture everything we need or have the capacity to do so. Thus a tariff would increase costs to consumers without doing one thing for steelworkers. Other trade actions are popping up, too. Boeing has asked the government to investigate what it considers to be unfair competition by Bombardier, a Canadian aircraft manufacturer. If Boeing succeeds in sidelining Bombadier, other US companies are likely to make similar claims. 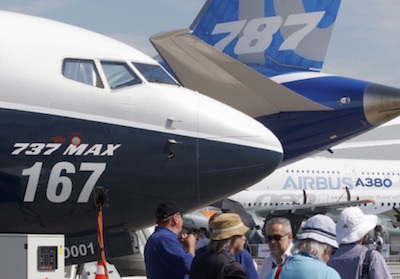 But, truth is, dozens of countries manufacture major parts of those Boeing airplanes; Boeing doles out contracts to other countries in order to encourage them to buy the planes. Many of those components are made in Canada. And I will bet you a dollar to 47 doughnuts that significant components of Bombardier planes are made in the United States by US workers. It behooves us to remember that Canada and all our other trade partners have options, too. All this will be completely unnecessary. Can existing trade agreements be improved? Yes, definitely. But trade negotiations are insanely complex in the best of circumstances. Multiplayer game theory applies. Right now we have general trade equilibrium, with minor adjustments all the time. Not everyone has everything they want, but no one is angry enough to stop playing. If one major player changes the rules, however, all the other players in the game have to respond. Those national players have their own businesses and voters that they must pander to. The game can collapse quickly. July 20, 2017, 12:06 a.m.
Cry havoc! And, let slip the dogs of war! Free trade or managed trade under the WTO is a scam. How can you have trade with a single party Communist government with no rule of law, no property rights, no just compensation for a taking, non-existent environmental enforcement ..........................? The reality is that the US is the buyer of first and last resort. And, our government has been using access to our vast consumer market in an attempt to bribe much of the world to play ball and help finance its deficit. In essence, it sacrificed the economic prospects of an entire generation of tens of millions of its own citizens in the working class for the benefit of a few. And, of course the well connected and well capitalized have front run changes to trade. Arbitraging the wage differentials between a solid middle class in the US against the poor peasants of the third world. It does not take a Ph.D in economics to figure out what will happen and who the losers will be. In a more honest time actual heads would be severed from necks when an elite sold out its people to such an extent. July 19, 2017, 3:25 p.m.
July 19, 2017, 3:03 p.m.
You can’t have it both ways. You can’t say you are against govt deficits and housing bubbles but want the current trade system or anything like it. Every dollar of a trade deficit takes away one dollar of profits (this is from Kalecki’s profit equation). To replace these lost profits, the US has to run govt deficits, housing bubbles, or student loan bubbles (essentially additional debt financed by money printing (e.g. QE)). They take our profits and we compensate to avoid a recession/depression. Economist who say that our trade deficit is due to the savings/investment imbalance are mistaken. It is like a 5 year old child saying that a car moves because magic smoke comes out of the exhaust pipe which causes the tires to move (based on correlation not causation). They have analyzed the economy, but have analyzed it backwards. The economic laws of thermodynamics are profits. We work for profits. We hire for profits, We start businesses for profits. It starts with them taking our profits to make their constituents happy and think their system works while we compensate to avoid collapse. Because we compensate the global corporations win with extra profits from the manipulators without a reduction in profits in the US. Trade is good. However it must be balanced. No excuses. July 19, 2017, 1:41 p.m.
Maybe the administration’s goal is something other than what we assume. The purported goal is to create American jobs, or that is my assumption. If not, then a goal has not been announced; it could be meant to be disruptive, but to what end? That’s the mysterious part to me. Also, I am not sure anyone can be genuinely surprised that there are administration advisors (e.g. Navarro) where facts and research are not the basis for policy, either. In the end, as John points out, I doubt it will create American jobs, as a trade war will likely foment a recession. July 19, 2017, 1:31 p.m. If “free” trade must be negotiated it is not free. It just means that a politically connected industry requires protection from its’ politicians. If Apple ships all manufacturing overseas, what happens to manufacturing workers here? They certainly have no money for iPhones. The Chinese who build them can’t afford them either. Short term (quarterly) profits and stock results are now supreme in Wall Street. It was not always so. There were yearly goals in most companies before 1975. Even today M.A.N. in Germany has a 5 year plan and sticks to it. There will be some pain short term by adjusting to “Buy American” but it will strengthen us long term.